The Aspen pool from Thursday Pools is a beautifully designed large rectangle pool with a built in tanning ledge/sun shelf area. 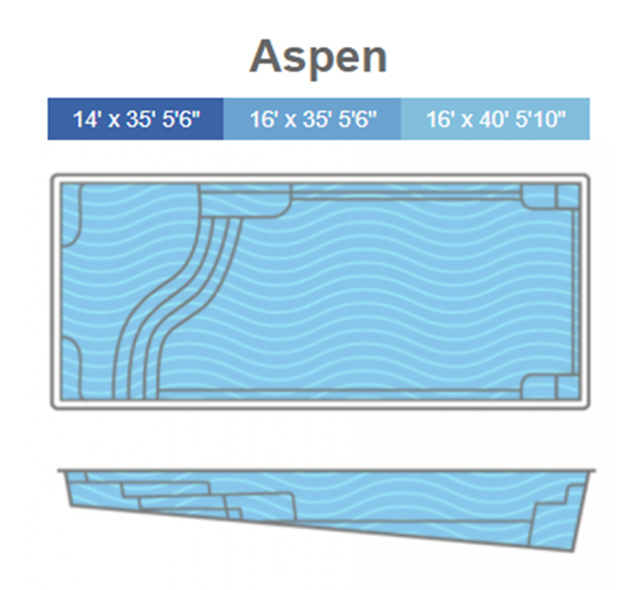 The Aspen pool is available in three different sizes. The largest size is 40′ x 16′, followed by the slightly smaller sized 35′ x 16′. The dimensions of the tanning ledge area doesn’t change between these two size as the deeper end of the pool just becomes 5′ shorter. A 35′ x 14′ version of this pool is also available for those with a little less yard space to work with. The built in tanning ledge/sun shelf area is approximately 1′ deep which is a perfect depth for adults to lay back and relax. It’s also a perfect space for small children to safely plan in the water (with adult supervision). Optional bubbler water features can also be added to the tanning ledge/sun shelf portion of the pool. Next to the tanning ledge area is a bench that can fit several adults. The deeper end of the pool also comes with two benches and an additional entry/exit step. One bench and additional entry/exit step comes on each side of the deep end. The Aspen pool is installed in Illinois by Signature Pools. The short video below is of a Aspen 1640 we designed and built in St. Charles, IL. The second video is a 360° video of the Aspen 1640 pool we designed and built in St. Charles, IL. Simply press play and then you can drag your mouse on the video screen to see the pool from a different angle.